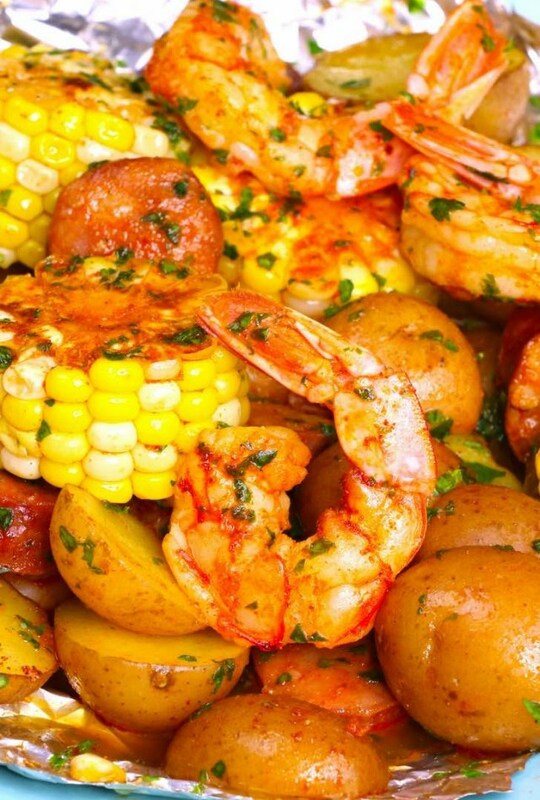 This Shrimp Boil is a mouthwatering cajun meal that's grilled or baked in foil packets. It features juicy jumbo shrimp, andouille sausage, corn and potatoes with a delicious blend of cajun spices. Perfect for a party and ready in just 20 minutes! Preheat your grill or oven to 425°F. Bring a small-medium saucepan of water to a boil. Boil the halved potatoes for 10 minutes to soften slightly. Meanwhile, make the foil packs. On a work surface, prepare 4 sheets of foil that are each at least 12 inches long. Add 1/4 of the shrimp, corn, parboiled potatoes and sausage to the middle of each piece of foil. Sprinkle cajun seasoning and drizzle olive oil across all 4 sheets. Fold up the edges of each piece of foil into a packet following the video. Ensure the packet is sealed tight and the foil doesn't get punctured. Grill or bake the packets for 12 minutes or until the shrimp are cooked through. Garnish with optional lemon juice, salt, pepper and parsley. Serve immediately and enjoy! * if the potatoes are larger than 1-inch, quarter them for quick cooking.